I will save a rant on the way Dr Seuss's legacy has been sold out by his widow, and how no librarian with any sense of Seuss should be promoting the crappy new movie of "The Lorax" for my Library Lady Rants blog. Here I will just talk about this week's Seuss related programs. I try to discourage parents from reading beginning reader books to their toddlers and preschoolers. Lots of them are fun--and the texts are brief, which may make them easier for short attention spans, but they lack the full language pre-readers need so much. They need books with full language, lots of new vocabulary, and if they do have brief texts, they ought to have lots to talk about in the pictures. 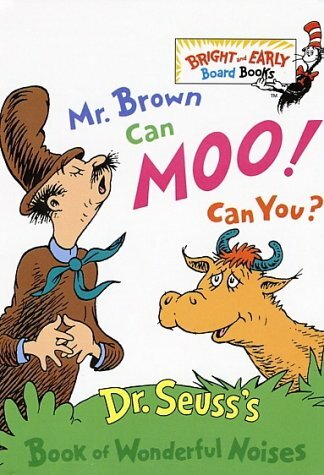 On the other hand, if you want to do Seuss at story hours, you've got a problem because his other, non-beginning reader books tend to have long,long texts with tons of tongue tangling made-up words. This is a big part of Seuss's charm for children, but it does make things hard on the grownups. And when you are a librarian doing story hours for a group, multiply that by 100 at least! Some years back I went to a Wolf Trap workshop on using music and books together. Most of it was either nonsense or stuff I'd done for years, but as usual, these workshops always give me something new to do, and at this one the instructor used "Hand, Hand, Fingers,Thumb"
I did this book with my 3-5 year old set, and brought in a drum. I let them try using "one thumb", then"one hand" and then "two hands". Each child got a turn. Some did patterns--real music, some just banged away, but all had fun. If you have enough drums or such to give everyone their own, you could try that, but I like doing it this way--more controlled and less cacophony! We also beat out some of the rhythms just with our hands, and mimed some of the other actions.All of it was fun. "A Book Of Wonderful Noises" This is a bit hard on the throat, but the enthusiasm with which even the 2 year olds respond to this book is truly impressive. And I am SURE that a "hippopotamus chewing gum" would really sound like "Grum, Grum"
I was reading this and was reminded of the wonderful sequence in "The Phantom Tollbooth" where Milo meets the Soundkeeper, and the sound of "an octopus opening a cellophane covered bathtub". Wonder if Seuss ever read that--bet he would have been a fan! I grew up in the late 1960s/early 1970s and one of the reasons I hate the Seuss crap now being produced so intensely is that back then CBS used to have fabulous kids programming almost every Friday night. And one of its staples were cartoons produced by Chuck Jones--the Chuck Jones of Bugs Bunny fame. He and Seuss had been colleagues since the Second World War, when they produced outstanding wartime cartoons for the US Army--look up "Private Snafu" on YouTube to see their work. I couldn't figure out a way to do "dark"--hard to turn off the lights and too awkward to duck under a blanket, so I just omitted it. And next time I am going to make signs saying "here" and "there". The "green eggs and ham" are barely visible under the umbrella--I blew up a cardboard cut out, backed it with stiff felt and used it that way. 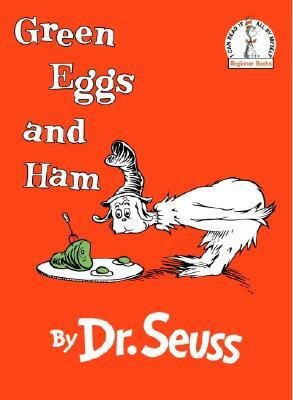 Next year I intend to make a green felt ham (you can buy them via Etsy, BTW) and use 2 green plastic eggs! For use it again I will. 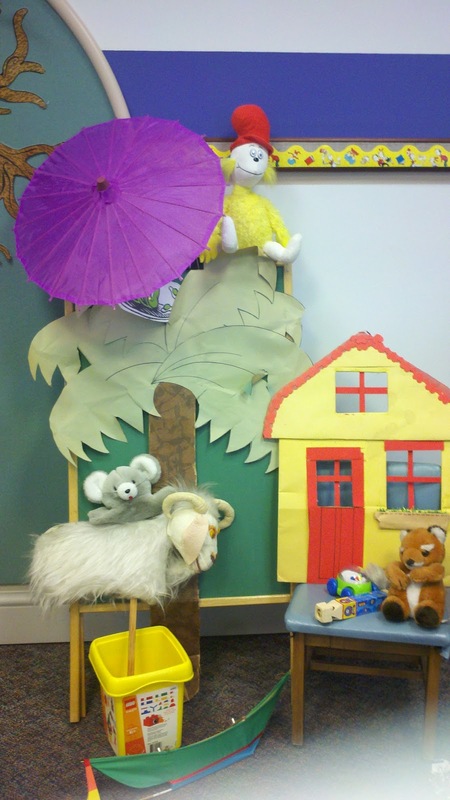 The kids loved this and joined in repeating all the items each time, which is good literacy practice. But above all this was FUN, in the best Seussian fashion. ...You are the guy (or gal) who'll decide where to go. So we watched the original, real "Green Eggs and Ham" and they each got a lovely fox stamp, since for some ridiculous reason there are no Seuss stamps at all. Of all the things NOT to sell..
And I hope none of them go to see that stupid "Lorax" travesty this weekend! A Suess rhyme that I love is from One Fish, Two Fish, Red Fish, Blue Fish - Did You Ever Ride a Wump? I made a faux flannel of a seven hump wump out of milk filters - I put it up and we talk about what kind of animal could this be, made up versus real animals, etc., then we do a lap/clap rhythm recitation of the rhyme several times, each time a little faster if I have older kids. The part they like best is I have them sit on their feet rather than criss-cross and when we get to the end we bump up and down as we count the humps of the Seven Hump Wump.